Reports hit the airwaves yesterday from London that Rafael Vinoly’s new tower at 20 Fenchurch Street melted a nearby Jaguar automobile. The color of the car, black, a common factor in increasing heat absorption, was apparently just enough to push the plastics past their melting point. And perhaps “melted” is too strong a term, as plastic becomes fluid and warps well below its melting point. On the other hand, one BBC report states that temperatures in the vicinity of the parking area were recorded at 196 degrees Fahrenheit, which is pretty darn hot in anyone’s book. It will be interesting to see how a British response contrasts to the nightmarish lack of response we’ve seen from the Dallas Museum Tower in Texas. 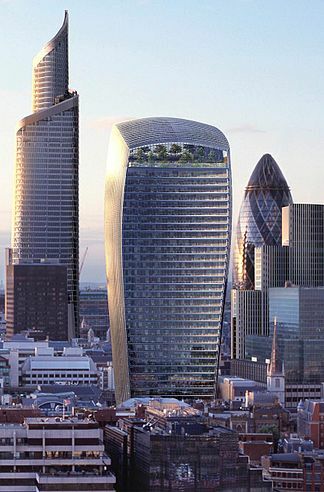 20 Fenchurch is a big building and its shape makes it very difficult to introduce shades that can block the convergence. So are we forced once again to fall back to applying window films as band-aids in the hope of reducing the reflections to a tolerable level? This approach degrades both the exterior and interior character of the building. When will we stop constructing 500 foot-high mirrored sculptures in our cities without first considering where the reflected light will go? And not just for concave surfaces such as this one, Dallas has shown us that you can create a catastrophe with convex surfaces as well. It leaves me wondering again what Mr. Vinoly’s design would look like had the reflections been considered at design time as they should have been. At the very least, he could have avoided an expensive fix and a whole lot of bad press.